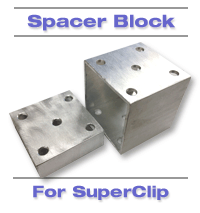 Aluminum Spacer Block is used with SuperClip for fastening Vortex and other brands of Solar Panels to an older roof with Flat or Barrel Tiles. Newer tile roofs are mechanically fastened to the plywood roof deck with screws, nails or TileBond adhesive to meet new Hurricane Wind requirements. For new code compliant tile roofs, the SuperClip can be fastened directly to the concrete tile. For older tile roofs installed before these new code requirements, the tiles were set in place using only mortar – this mounting method of the tiles is not sufficient to hold a solar heating system to the roof during high winds using only the standard SuperClip fastener. The SuperClip must be fastened to the wood deck beneath the tiles. In order to make this connection, a spacer block must be used to elevate the SuperClip to the proper height while maintaining the mechanical connection to the wood deck. The SuperClip Space Block is made to fit various tile heights, and provides five mounting holes to give maximum pull-out value to meet new codes. For standard Flat Tiles, use the 1” SuperClip Spacer Block; for standard Barrel Tiles, use the 3” SuperClip Spacer Block. Custom sizes are available upon request.